How much excitement can you cram into a 10 day tour in England and Wales? Plenty, as our 2009 tour included visits to six wonderful teddy bear shops, Antique centers throughout the Cotswolds, street markets in some delightful villages, castle and garden visits, charity shops in every town we visited and some exciting teddy bear discoveries (both old and new) in gift and specialty shops. Tour was June 15 through June 24, 2009. Our dozen guests this year joined the tour from Washington State, Texas, Colorado, Kentucky, Oklahoma, Michigan, and a couple from Germany. Most of our guests are repeaters from previous years, some who have been on our tours 7 and 8 times. Doris and I arrange for all the accommodations. The first and last nights were at a hotel near the airport in London, since guests are flying in from a variety of locations. We then go on tour in a private coach that takes us to a central location for our hotel accommodations, doing day trips by coach to various venues from there. This is a major advantage, as you do not have to pack bags and move to a different hotel every night. Our first adventure was a 17th Century Manor near Gloucester and our tour headquarters. Nigel Readman was our coach driver as he has been for the past 12 years, and he is most helpful with ideas and suggestions for added venues. 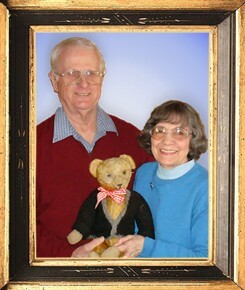 Enroute we stopped at Teddy Bears of Witney, a delightful shop that has been operated by Ian Pout for many years. It is best known as the home of Alfonzo, a rare 1908 Steiff teddy that was originally made for a Princess of Russia. Ian has also acquired some other famous bears that are on display. We gave our guests plenty of time at this shop, and many came out carrying one or more packages. 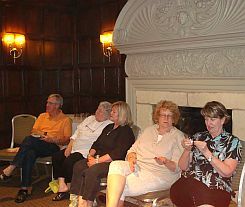 We always have a group gathering each evening to discuss the days events and have a "show and tell", and that first evening there was much to show and tell about. After a hearty English breakfast the next day, we set out for the town of Tetbury, known for its many antique shops. A number of our guests headed for the Top Banana Antiques Mall. It has 3 floors of antiques and collectibles of every description including a few old teddies. Tetbury is near Highgrove, the home of Prince Charles, and although his home is not open to the public, he and his wife Camilla have opened a gift shop called Highgrove on the High street. As an added bonus, we made a stop at Abbey House Gardens, covering five acres directly beside the ruins of an early Abbey. Since our hotel was located just outside the town of Gloucester, we chose to spend one day seeing the many sights it has to offer. 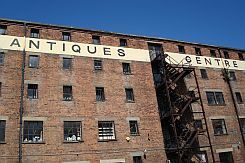 We started the day with a visit to the docks area, where an Antique Centre takes up the entire four stories of an early warehouse. 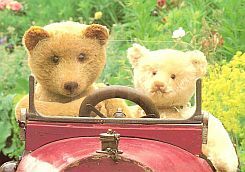 It is also the location of Apple Pie House, a teddy bear emporium operated by host Graeme Miles. Small in size as many of the British teddy shops are, it was packed from floor to ceiling with teddies of every brand, artist bears, Gollies and other delightful collectibles. While some guests spent time in his shop, others explored the 100 + shops on four floors, searching for treasures. After several hours a number of our guests headed for the central shopping area. 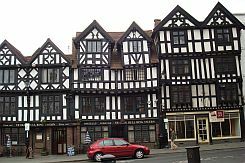 There they could visit the famous Cathedral, or take a small side street to discover the Tailor Of Gloucester's Museum of Beatrix Potter. Another day trip on this tour was to the world Heritage site of Bath, famous for the mineral water baths built by the Romans. Our visit to Bath was timed to be there on a Saturday so we could take in their weekly street antique and flea market. Known to the locals as "the flea", about 25 or 30 dealers set up displays but provided many of us with some treasures that just had to make the trip back home with us. Just around the corner from "the flea" is The House of Bears." It is small but packed full of characters including Rupert, Paddington, Peter Rabbit and many others. 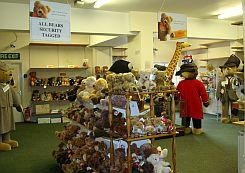 The shop offers unique designs by British bear artists, and all the leading manufacturers in the bear world. An exciting discovery this year was the village of Hay-on-Wye in Wales. 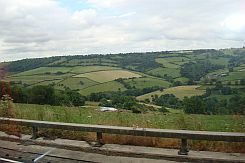 It sits right on the border of England and Wales. This small village is the home to 35 to 41 book stores! Many of the book shops offer used books and is known as the used book capital of the world! Of particular interest to our group was Mr. Puzzle's Jigsaw World and Teddy Bear Wonderland. There we found several rooms filled with wonderful teddy bears. Standing guard at various points in the room are life-size bears in various British costumes crafted by the famous British firm of Merrythought. Our final day of exploring, eating and shopping was in Ludlow, a town in the North west central part of England that is known for its magnificent castle. Ludlow castle is right in the town of Ludlow, and as you would expect, it does have a teddy shop, appropriately named Little Paws. It is located right in the town square, where a street market was underway on the day of our visit. From large size teddies that you could barely get your arms around, to magnificent tiny bears and metal figures that measure just a fraction of an inch in hand painted colors plus every size in between were offered. There is always time for one more teddy store visit and our trip back to our lodging near the airport included a visit to the famous Henley-on-Thames, home of the annual Regatta and the world famous Asquiths Teddy Bear shop. Joan Bland and her husband Ian operate this charming shop, and in addition to the full array of manufactured bears and artist bears, they have their very own line of exclusive bear designs. Our timing was perfect, as shortly after our arrival the shop was visited by famous American actor David Hasselhoff! His entourage was filming so we were kept at bay, but he did give a wave to our guests that had just boarded the coach. We can highly recommend a visit to Great Britain, whether you choose to join a tour or venture on your own. Many of our guests choose to go a few days early or stay over, which gives them the best of both worlds traveling on your own vs. going with a tour group. We are now in the early stages of organizing the tour for 2010. A proper teddy tour is shown in this great postcard by Ian Pout. Entrance to Teddy Bears of Witney. Heather and Paula Cook making some difficult decisions in Ian Pout's Teddy Bear Shop. 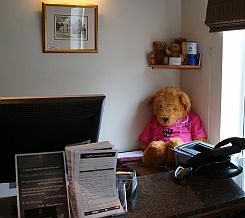 “We knew we were in the right place when we stepped up to the the reception desk at Hatherley Manor hotel,” said Doris. 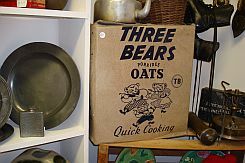 A charming box of porridge oats tempted us at the Top Banana antique mall. You can spend a whole day searching for treasures in the Antique Centre in Gloucester. 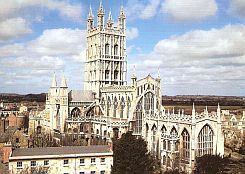 Postcard of a magnificent Cathedral in Gloucester. 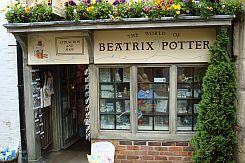 Beatrix Potter shop is quaint. 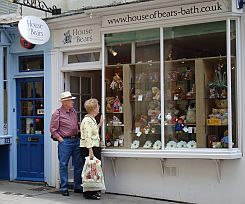 House of Bears shop in Bath caught the attention of Texas guest's Dee and Jim Moyes as they gazed at the window display. Mr. Puzzle’s Jigsaw World & Teddy Bear Wonderland in Hay-on-Wye. Guest Barbara Kennell discovers an armful at the Little Paws shop in Ludlow. 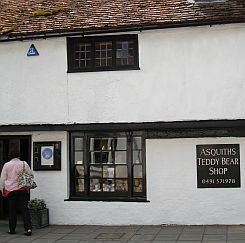 Joan & Ian Bland were wonderful hosts to the group at Asquiths in Henley Teddy Bear Shop. The architecture in England is always breath taking. 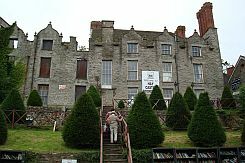 A book store in Hay-on-Wye Wales that left us Gobsmacked! Show and tell was always exciting each evening at our hotel. Photo opportunities at nearly every turn from the coach window. eMail us if you would like to add your name to our mailing list. 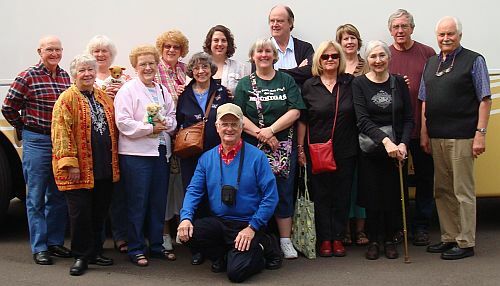 The enthusiastic Carrousel Tour group of 2009. Won't you join us in 2010? Click on the banner for tour information.